CRD - Creator Ready Driver releases are timed to key creative application updates, ensuring the best compatibility and performance for those who depend on PCs for their creative work. These drivers support GeForce GTX 10-series "Pascal," GeForce GTX 16-series "Turing," GeForce RTX 20-series "Turing," and TITAN products based on the "Pascal," "Volta" and "Turing" architectures. This means the 900-series "Maxwell" is not supported. Have you read our ASUS STRIX GeForce GTX 1660 Ti review already? I mean, you get them as a new driver for RTX 2080 and release notes contain purely gaming related fixes. I'll bite. What's with this Maxwell absence lately. Fail, guess I'll mod them myself. "All NVIDIA drivers provide full features and application support for top games and creative applications. If you are a content creator who prioritizes stability and quality for creative workflows including video editing, animation, photography, graphic design, and livestreaming, choose Creator Ready Drivers." Dloading... The latest 419.62 made my 2080 fans to go haywire! I would download this one. : NVAPI calls take a large amount of CPU time. I guess I'll try this tomorrow. I just want chromium to not flash black. The last good drivers I had was 417.71 and 58.
not a huge difference over the previous really..
give or take, can usually get over 13 if i oc a little. and in real world gaming? like a shadow of tomb raider, battlefield, metro exodus, far cry new dawn, hitman 2 and others? as they said this is not for gaming, you can test the performance difference in software like blender https://www.blender.org/ try downloading the benchmarks here http://blenchmark.com/, and compare. 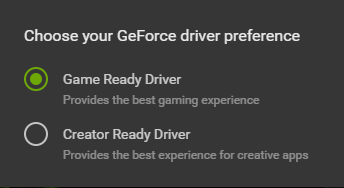 Both Game Ready Drivers and Creator Ready Drivers will include the full NVIDIA feature set and application support for games and creative apps, so users can continue to use either driver they prefer. The difference is that Game Ready ones are released for new games while this one will probably be released when a new Photoshop version is out or something. So, everything remains exactly the same except a few Geforce drivers will be marked as Creator drivers which means "these are tested (more thoroughly) with content creator applications" (meaning these are supposed to be more stable while running those applications than an arbitrary Game Ready version). And from now on Geforce drivers will revive some extra application specific optimizations (all versions, Game Ready included) for these "creator" applications (which sounds like they just activate some previously Quadro-only driver optimizations in Geforce drivers as well, but not all of them). So, everything remains exactly the same except a few Geforce drivers will be marked as Creator drivers which means "these are tested (more thoroughly) with content creator applications" (meaning these are supposed to be more stable while running those applications than an arbitrary Game Ready version). And from now on Geforce drivers will revive some extra application specific optimizations (all versions) for these "creator" applications (which sounds like they just activate some previously Quadro-only driver optimizations in Geforce drivers as well, but not all of them). Basically "game ready" are bleeding edge which are (potentially) sacrificing stability for the support of latest titles and "creator ready" are more tested and ironed out releases. At least, that's how I understood it. Are Creator Drivers also bundles with GF experience, tracking and other bloatware? Nah, they are the same. Game Ready comes with optimizations (well, yeah) for recently released games. These - for recently released creative/production software. Both contain the same fixes from previous releases. No I meant they are new so they may have some sort of bugs like you mentioned.